Over the past two decades, the term “modernization” has been widely used by foreign affairs experts, military and political leaders, and intelligence analysts to describe the startling rapidity of the Chinese military’s rise from an arguably primitive force to one of the most technologically-advanced militaries in the world. In his article, “China: A Threat or a Challenge: Its Air Power Potential”, Indian Air Marshall RS Bedi describes modernization as “a dynamic process to keep abreast with the latest” (Bedi, p3). By applying lessons learned from its military actions against U.S. forces during the Korean War and observations made during later conflicts such as Operation Desert Shield/Desert Storm, NATO operations in the Balkans, and Operations Enduring Freedom and Iraqi Freedom, the PLA have kept abreast of the significant role of airpower in modern warfare. Accordingly, both the People’s Liberation Army Air Force (PLAAF) and People’s Liberation Army Naval Air Force (PLANAF) have quickly progressed through this “dynamic process” and have emerged as a force capable of countering American and regional neighbor land- and sea-based airpower, including aircraft carriers, cruise missiles, and long-range bombers. Via informative writing and a litany of glorious, colored and black & white photographs, Modern Chinese Warplanes leads readers along the PLA air forces’ progressive path toward today’s modernized force. Chock full of vivid and informative photographs, readers are immediately transfixed. To invoke a classic adage, if a picture speaks a thousand words, then even a cursory flip through the pages reveals a stunning, photographic summary and leaves the reader eager to investigate the accompanying text. 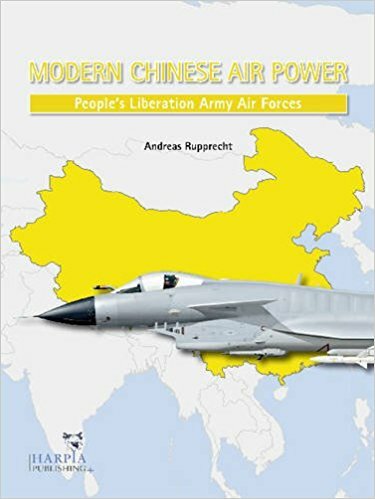 The first chapter of Modern Chinese Warplanes is dedicated to describing the origins, progressions, and even setbacks of both the PLAAF and the PLANAF, thus providing succinct yet informative context toward understanding how remarkable the modernization of China’s air forces has been. Although the PLAAF and PLANAF were established in 1949 and 1952 respectively, it could be argued that the modernization of today’s force was born from the compelling wake-up call presented to Chinese Communist Party (CCP) and People’s Liberation Army (PLA) leadership during the 1991 U.S.-led military operations in Iraq. Using Rupprecht and Cooper’s description, U.S. operations in Iraq “shocked the PLA into the realization that it had to become capable of engaging in high-tech warfare or otherwise face the certainty of falling ever further behind other modern militaries.” This marked a momentous shift in Chinese national military strategy and the subsequent 1993 issuance of the “The Military Strategic Guidelines for the New Period” by the CCP and PLA. Thus, if 1993 can be considered the start of China’s current military modernization period, the mere 24-year rise in military capabilities of the PLA, arguably now on par with the world’s leading military forces, is even more remarkable. After Chapter 1’s useful historical context, Rupprecht and Cooper use Chapters 2 through 6 to succinctly present the book’s stated objective: to provide “a summary of the Chinese air arms as they are today, what equipment they operate, and how this equipment is organized.” Chapters two and three both describe and illustrate China’s modern combat aircraft, combat support aircraft, and associated armament. Chapter two’s introductory pages aptly describe Chinese aviation nomenclature and unique designations but then seemingly gloss over China’s numerous aircraft manufacturing companies. 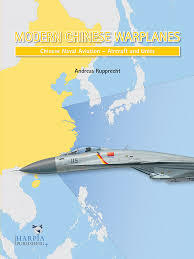 Admittedly this area is outside the scope of Modern Chinese Warplanes; however, readers seeking additional information regarding Chinese aircraft manufacturing companies would benefit by combining this book with The Chinese Air Force; Evolving Concepts, Roles, and Capabilities by National Defense University Press (Hallion). The remainder of Chapters two and three however, present information that is well-researched and effectively organized into an almost encyclopedic presentation of each aircraft’s unique characteristics, performance parameters, and weaponry. The vibrant pictures and charts are wonderfully placed and provide ample relevance. An especially intriguing inclusion within Chapter 2, especially to military analysts and aircraft enthusiasts, is the sections entitled “Future” at the conclusion of each aircraft’s narrative. These paragraphs provide the reader with tantalizing hints regarding future aircraft developments, variants, and designations – details that would need to be expounded upon in a possible update. Additionally, Chapter four provides a highly-informative explanation of PLA aircraft markings and serial number systems – information neither readily available nor widely understood. The only thing going against Modern Chinese Warplanes is time, for today the term “modern,” as the book’s title implies, is especially fleeting regarding the modernization of the Chinese military and its air forces. Since the book’s 2012 publication date, further reflected in the 2012 Order of Battle in chapters five and six, numerous changes have occurred within China’s political and military structures that, if the authors and publisher do not address, will quickly render this book irrelevant: In November 2012, Xi Jinping assumed China’s presidency and chairmanship of the Central Military Commission (CMC), quickly embarking on a campaign to reorganize the PLA, including restructuring the existing military regions. This effort was realized in February 2016 as the seven military regions described in Modern Chinese Warplanes were reorganized into five theater commands – a reorganization which also affected the subordinate command structures (Wuthnow). Additionally, in 2013–2014, China initiated substantial dredging and land reclamation projects in the Spratly and Paracel Islands. These efforts continued, despite international backlash and in the face of a ruling by an international tribunal in The Hague in July 2016 which officially stated that China’s expansive claim to sovereignty over the waters of the South China Sea (SCS) had no legal basis. Today, these projects have resulted in three highly-functional artificial islands which are strategically located in the southern portion of the SCS and are fully capable of hosting Chinese military aircraft (Kyodo). 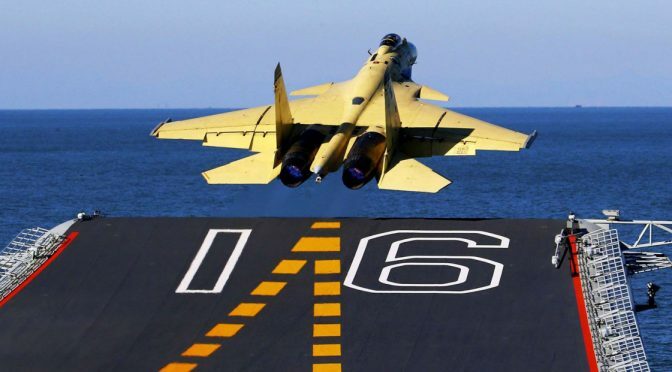 Furthermore and more specifically, the PLA has accelerated its 4th and 5th-generation aircraft and armament development programs; therefore, many of the programs or technologies only hinted at within the pages of Modern Chinese Warplanes such as the Chengdu J-20 stealth fighter, Shenyang J-15 aircraft carrier-based fighter, and the Xian Y-20 heavy transport aircraft have rapidly progressed to the point of entering service in the PLAAF and/or PLANAF (Adams). Finally, the PLA continues to initiate or expand military aviation and armament developmental programs. 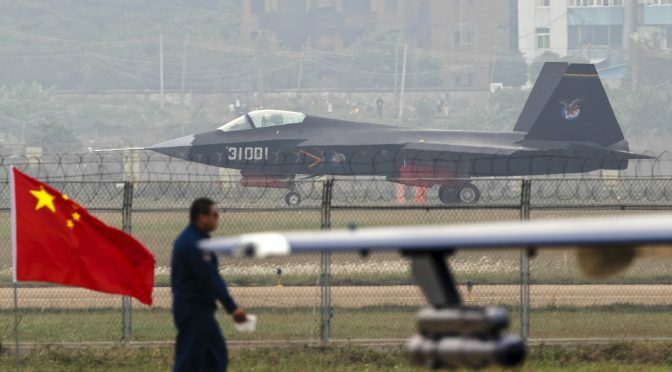 Modern Chinese Warplanes needs to be updated to further reflect the ongoing advances in PLAAF and PLANAF aviation platforms and technologies such as the Shenyang J-31 “Gyrfalcon”/”Falcon Hawk” stealth fighter (Fisher), the CJ-20 long-range land-attack cruise missile (LACM), and the YJ-12 long-range anti-ship cruise missile (ASCM) (Roblin). LCDR David Barr is a career intelligence officer and currently within the Directorate for Intelligence and Information Operations for U.S. Pacific Fleet. His opinions do not represent those of the U.S. Government, Department of Defense, or the Department of the Navy. Dutton, Peter, Andrew S. Erickson, and Ryan Martinson. 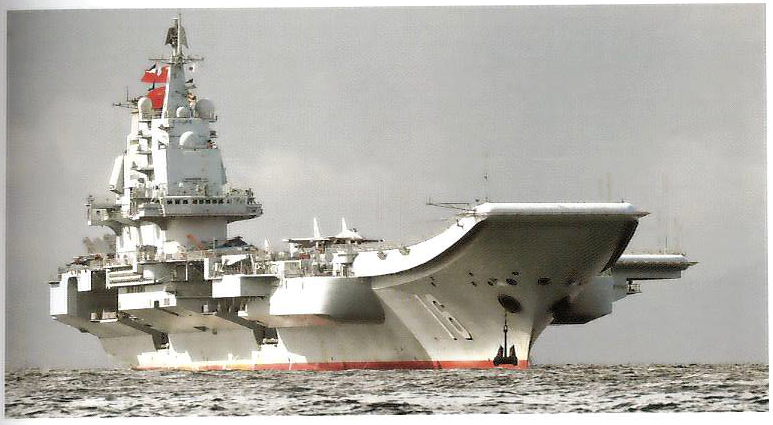 China’s Near Seas Combat Capabilities. Newport: U.S. Naval War College; China Maritime Studies, 2014. Hallion, Richard, P., Roger Cliff, and Phillip C. Saunders. The Chinese Air Force: Evolving Concepts, Roles, and Capabilities. Washington, D.C.: National Defense University Press, 2012. Rupprecht, Andreas, and Tom Cooper. 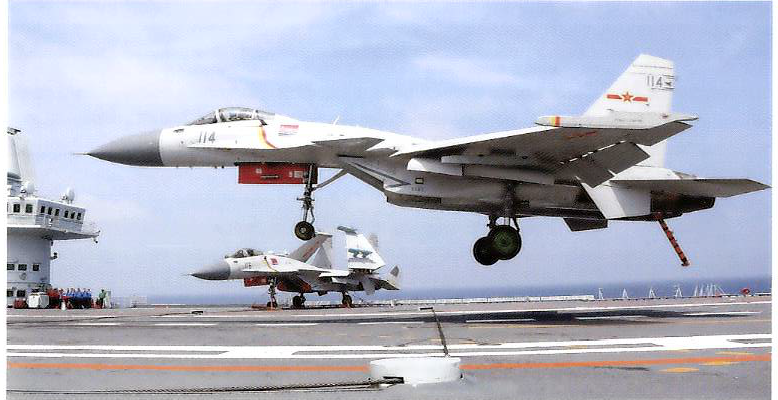 Modern Chinese Warplanes: Combat Aircraft and Units of the Chinese Air Force and Naval Aviation. Houston: Harpia Publishing, 2012. Former U.S. president William Clinton once said that whenever a crisis breaks out, the first question that comes to everyone’s mind would be “Where is the nearest carrier?” In the half century after World War Two, Washington employed force in response to some 200 crises, and carriers were involved in two-thirds of them. On the other hand, the U.S. Army and U.S. Air Force (USAF) were involved in 38 and 53 of these incidents respectively. This contrast came about because the large-deck carrier of the United States Navy (USN) offered a number of unique advantages over other combat platforms. 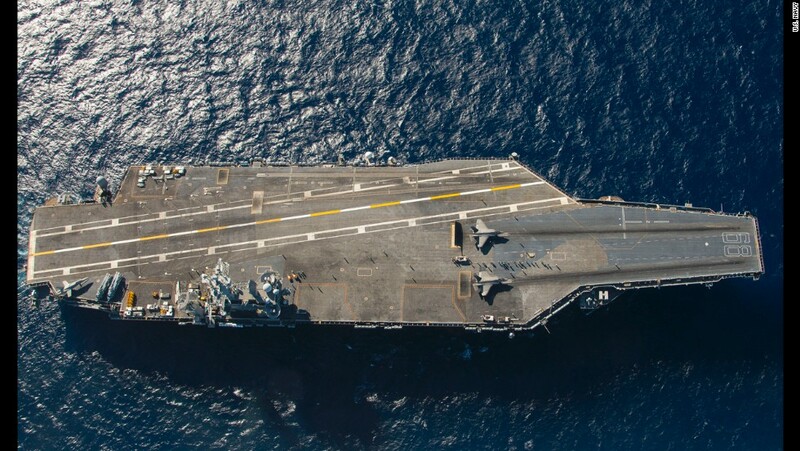 Esteemed naval analyst Norman Polmar said: “(The) survival of the aircraft carrier… can be attributed to… territorial independence, flexibility of striking power, (and) mobility.” These three attributes will be explored in this article. During times when defense spending is tight and when different branches of the American military vie for the budgetary pie, the aircraft carrier would often be subjected to criticism by other services, especially the Air Force. This is because the vessel is deemed to be a major competitor for scarce resources, owing to its high price tag and a perception that it is taking over some USAF roles. 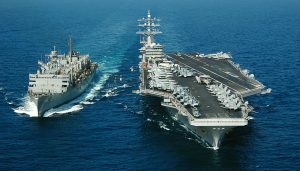 Nevertheless, even some of the harshest critics of the USN have begrudgingly alluded to some advantages unique to the carrier, the most important of which is arguably the territorial independence that allows it to conduct operations unconstrained by political limitations. A U.S. carrier strike group, with its own logistical infrastructure and force-projection capabilities, makes an ideal tool for intervention. This is especially so in cases where American interests are not aligned with those of allies, and this could result in Washington not having access to air bases. The carrier’s territorial independence would thus come in handy if local issues were to make it difficult for land-based airpower to be deployed. A related issue is that of friendly air bases being attacked. According to a RAND report, the U.S. has 28 major air bases on the geostrategically and economically critical Eurasian landmass. Although land bases are closer to potential hotspots, they are also closer to likely adversaries and could be targeted more easily during a conflict, making them more vulnerable than carriers. As a USN officer maintained: “I can’t tell you where… our carriers are… but given a few moments of research at Base Ops, I can give you the coordinates of every Air Force runway… and hangar worldwide.” The proliferation of missiles and their enabling systems such as satellites in the post-Cold War period has led to several nations gaining the capability to target U.S. bases. Indeed, this threat has become more serious with the advent of more advanced weapon technologies in recent years. This is arguably why Washington is realigning forces from Okinawa to Guam and setting up a new Marine contingent in Australia – to hedge against American forces in north-east Asia being targeted by China’s A2/AD systems during a conflict. There have been no studies that do not acknowledge the vulnerabilities of land bases to anti-access threats; furthermore, even the most optimistic of such reports. Equally troublesome for America in times of crisis is the refusal of nations to grant over-flight  and aircraft deployment rights – an issue which the carrier does not face. The denial of over-flight rights to land-based aircraft could complicate Washington’s strategy. During Operation El Dorado Canyon, France, Spain, and Portugal denied over-flight rights to U.S. aircraft; consequently, the USAF F-111 Aardvarks involved had to be refueled in mid-air several times, a problem not faced by the carriers involved in the same operation as the ships were situated contiguously in the battlespace. The phallic reference may sound exaggerated, but it was a fact that American land-based airpower was effectively emasculated when it could not operate out of its Middle Eastern bases for Desert Strike. All in all, American carriers have proved to be useful for their territorial independence. This characteristic – combined with their mobility – essentially allows them to act as “first responders” to any situation. Our ability to deliver… firepower and generate… high aircraft sortie rates can… impact on… a conflict… during the critical early period of a joint campaign, when… U.S.-based forces are just starting to arrive in theater. – Admiral Jay Johnson, U.S. Chief of Naval Operations from 1996 to 2000. When the deployment order comes, a carrier group moving at even a moderate speed of 25 knots can cover a significant 600 nautical miles in 24 hours of continuous steaming. To illustrate, a U.S. carrier group near Guam moving at that speed would take just over two days to reach the vicinity of Taiwan in the event of a Taiwan Strait crisis. Suffice it to say that it would reach there even sooner at a higher speed. The mobility that enables a carrier to act as a first responder was manifested as early as the Korean War. From the invasion of South Korea by the North in June 1950 until the Inchon landings in September, American and British carriers provided the sole tactical aviation assets as the number of South Korean-based aircraft was small and the USAF platforms in Japan were too short-ranged to have significant loiter time over targets. USS DWIGHT D. EISENHOWER (CVN 69) with Carrier Air Wing SEVEN embarked (right) conduct an underway replenishment with USNS ARCTIC (T-AOE 8) (left). Image credit: MC2 Miguel Contreras, USN. To get such a glowing assessment from a top officer in a rival service undoubtedly attests to the carrier’s unequalled utility in responding first to a crisis. In addition, the aforementioned carriers provided air cover for the deployment of equipment to Saudi Arabia since viable shore-based offensive airpower was available only three weeks after the crisis broke out. 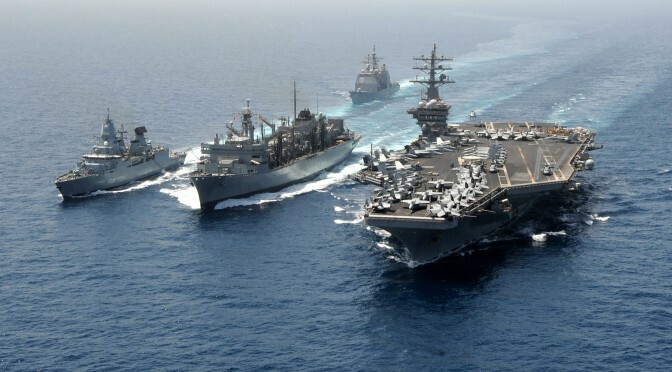 Had Iraq invaded Saudi Arabia within this period, the two U.S. carriers on station would have been even more crucial as they were the only assets in theater that could take the fight to the enemy. Another inherent advantage offered by the carrier to U.S. theater commanders is that it can conduct a wide variety of operations because of the different types of aircraft embarked on it. To be sure, land bases can accommodate a wide range of aircraft as well, but they simply lack the unique attributes of territorial independence and mobility offered by the large-deck carrier as discussed earlier. The typical carrier air wing (CVW) today consists of 44 F/A-18 Hornet/Super Hornet fighters, five EA-18 Growler electronic warfare aircraft, four Hawkeye airborne early-warning platforms, and 19 MH-60 Seahawk helicopters. Indeed, during its 50-year service from 1962 to 2012, USS Enterprise operated 43 types of aircraft. This ability to accommodate diverse aircraft enables the carrier to carry out a wide range of missions. This was evidenced during Operation Deliberate Force when carrier planes participated in the whole gamut of operations: close air support, search-and-rescue, and enforcement of the no-fly zone. Because the carrier is such a large platform, it can integrate assets from other services, even other nations, into its operations. This is crucial with today’s emphasis on jointness between the American armed services, and interoperability between Washington and her allies. In the current combat environment characterized by fluidity, the capabilities needed in one region or situation may not be the same as another, and thus why the ease of modifying the CVW is useful. To illustrate, during Operation Uphold Democracy, USS America and USS Eisenhower carried elements of the 160th Special Operations Aviation Regiment and the aviation component of the 10th Mountain Division, the ship’s organic air wings having being temporarily removed. Two F-35s on the deck of the USS Nimitz during the first carrier trials for the aircraft in November 2014. US Navy photo. The carrier has proved to be an extremely useful platform for the U.S. National Command Authorities, but it must be noted that the deployments delineated above occurred where anti-access threats were at best marginal. In an anti-access/area-denial environment, would the carrier be given carte blanche to project its airpower? Would its survivability be seriously questioned by the submarine and other anti-ship systems? These are but some of the key questions shaping the debate over the utility of the aircraft carrier, and my full article addresses some of them. Ben Ho Wan Beng is a Senior Analyst with the Military Studies Programme at Singapore’s S. Rajaratnam School of International Studies, and he received his master’s degree in strategic studies from the same institution. Ben is a CIMSEC member and has published with the likes of The Diplomat, The National Interest, and Real Clear Defense. Jeffrey G. Barlow, “Answering the Call: Carriers in Crisis Response Since World War II,” Naval Aviation News, January-February 1997, fas.org/man/dod-101/sys/ship/docs/970100-jb.htm. Reuven Leopold, Sea-Based Aviation and the Next U.S. Aircraft Carrier Design: The CVX (Cambridge, Massachusetts: Center for International Studies, 1998), p. 4. Norman Polmar, Aircraft Carriers: A Graphic History of Carrier Aviation and Its Influence on World Events (New York: Doubleday, 1969), p. vii. Quoted in Leopold, Sea-Based Aviation, p. 5. Jacquelyn K. Davis, Aircraft Carriers and the Role of Naval Power in the Twenty-First Century (Cambridge, Massachusetts: Institute of Foreign Policy Analysis, 1993), p. 34. Michael J. Lostumbo, et al., Overseas Basing of U.S. Military Forces: An Assessment of Relative Costs and Strategic Benefits (Santa Monica, California: RAND Corporation, 2013), p. 20-30. Quoted in James Paulsen, “Is the Days of the Aircraft Carrier Over?” (Air Command and Staff College Research Report, 1998), p. 20. Cheryl Pellerin, “Work: Guam is “Strategic Hub to Asia-Pacific Rebalance,” DoD News, August 19, 2014, defense.gov/news/newsarticle.aspx?id=122961. Sam J. Tangredi, Anti-Access Warfare: Countering A2/AD Strategies (Annapolis: Naval Institute Press, 2013), p. 68. It must be noted that this point applies only to states contiguous to the sea where the carrier is deployed; overflight rights are still needed for aircraft seeking to reach countries situated landward of a coastal state. Leopold, Sea-Based Aviation, p. 4. Tangredi, Anti-Access Warfare, p. 49. Davis, Aircraft Carriers, p. 34. Operation Desert Strike was initiated by the United States in September 1996 in response to the Iraqi military offensive against the city of Irbil in Iraqi Kurdistan. Quoted in Bowie, The Anti-Access Threat, p. 3. Angelyn Jewell, Carrier Firepower – Realising the Potential (Alexandra, Virginia: Center for Naval Analyses, 1999), p. 5. According to the author’s calculation, at 25 knots, it would take some 52 hours to cover the distance of about 1,300nm between Guam and the waters off eastern Taiwan, which is derived from Google Maps. Davis, Aircraft Carriers, p. 22. John Pay, “Full Circle: The U.S. Navy and its Carriers: 1974-1993,” in Seapower: Theory and Practice, ed. Geoffrey Till (Portland: Frank Cass, 1994), p. 136. David Barno, Nora Bensahel and M. Thomas Davis, The Carrier Air Wing of the Future (Washington, D.C.: Center for a New American Century), p. 8. Rebecca Maksel, “The Future of Aircraft Carriers,” Air & Space, January 15, 2015, airspacemag.com/daily-planet/future-aircraft-carriers-180953905. Lambeth, American Carrier Air Power, p.37. This was the 1994 intervention in Haiti to remove the military regime installed by the 1991 coup overthrew the elected President Jean-Bertrand Aristide. Admirals Rowden, Gumataotao, and Fanta introduced the concept of distributed lethality over a year ago as a “means to increase the offensive might of the surface force and employ ships in dispersed formations known as ‘hunter killer surface action groups.’”[i] The basic concept as outlined in the original article and further discussion has evolved into “the condition gained by increasing the offensive power and defensive hardening of individual warships and then employing them not only in traditional roles but also in different ways than have been the practice in the past few decades” according to Ryan Kelly. [ii] Discussion and interest grew around the country over the past year and with the formation of the Distributed Lethality Task Force. Many great minds have come together, primarily from the surface navy, to offer ideas and solutions. Furthermore, three key initiatives describe what needs to be harnessed within Distributed Lethality: To Deceive, Target, and Destroy. In this article we build upon the ideas of Mr. Filipoff, specifically focusing on the unique capabilities of the E-2D Advanced Hawkeye. Before proceeding further it might be helpful to offer some background information on the Hawkeye Community and its relevant areas of warfighting focus. The Hawkeye was developed primarily as a blue water airborne early warning platform capable of long range detection of both aircraft and ships. While detection is the primary organic capability, Hawkeye aircrew are well versed executing real time command and control over a wide range of mission sets, including anti-surface warfare (ASuW). Through application of the Composite Warfare Commander (CWC) concept, new air intercept controllers and mission commanders learn the basics of conducting ASuW during the earliest stages of their training, which is then built upon throughout the work up cycle. At the same time, as an airborne C2 asset the Hawkeye is more than capable of bridging the gap (both literally through network relay and bridging, and figuratively through the ability to have one coordination entity) between warfare commanders. E-2D Advanced Hawkeye flown by Test and Evaluation Squadron TWO ZERO demonstrating proof of concept of in flight refueling. Photo taken by Kelly Schindler (US Navy). That being said, no amount of training or warfighting culture is going to matter if processes are not in place to make use of that corporate knowledge. 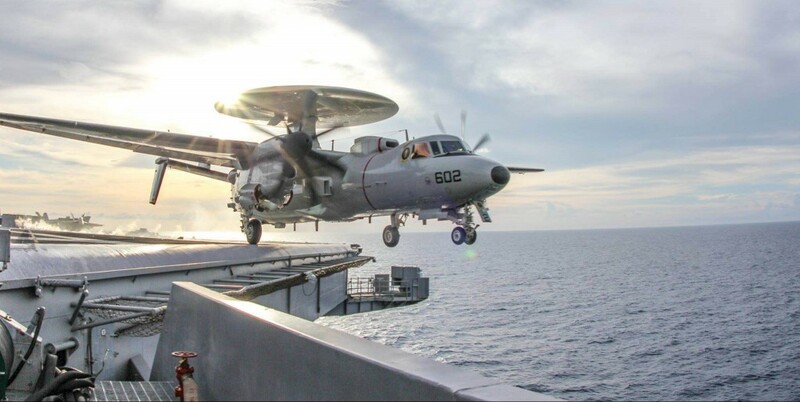 Enter the E-2D Advanced Hawkeye with the APY-9 radar and associated sensors and communications equipment. While specific ranges of the radar are classified, suffice to say that the APY-9 greatly increases the ability of a strike group (or individual cruiser or destroyer) to detect and classify contacts at range. Furthermore, the data link and communication suite enables the Hawkeye to connect widely dispersed forces through multiple networks and means of voice communication. The continuing development of integrated fires offers unique employment options. Taking into account the systems as well as the aircrew operating the platform, the organic and currently fielded capabilities of the E-2D Advanced Hawkeye serving as the centralizing C2 node, bring the persistent ISR (intelligence, surveillance, and reconnaissance), Command and Control, and strike group defense capabilities otherwise unavailable to the distributed fleet. 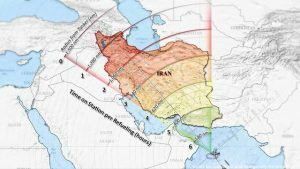 How should the upcoming Adaptive Force Package be employed: including Tactical Situation (TACSIT) execution, organic and inorganic targeting, fielding of modified weapons, and improved integration with Amphibious Forces and Expeditionary Marine Corps units in support of sea control operations? 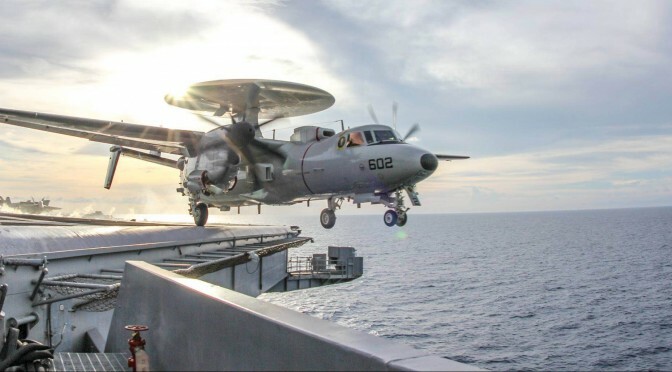 First and foremost, the E-2 Hawkeye is an airborne command and control platform, capable of providing both C2 technology as well as “man-in-the-loop” decision making, necessary for effective control of a dispersed and dynamic battlespace. The E-2 is equipped with various data link capabilities which allow for the sharing of not only track data but also raw sensor information. Additionally, the communication suite in a Hawkeye includes V/UHF, HF, and SATCOM communications with various options for secure and anti-jam capabilities. The typical stationing altitude of a Hawkeye and the power output of the communication and data link equipment allows for a large range of operation ensuring a widely dispersed fleet can stay connected without the requirement for individual ships to maintain line of sight with each other. Furthermore, the highly trained crew of the Hawkeye is capable of assessing the situation and making decisions for various commanders – carrying out their intent across various warfighting domains. This allows for the efficient choice of targeting solutions for offensive and defensive scenarios across the battlespace. And finally, the warfighting experience of the crew allows for tailoring of information for specific recipients, ultimately cutting down the volume of information sent. For example, what the air defense commander needs to know is not necessarily what the surface warfare commander needs to know, or what the OTC or JFMCC need to know. The Hawkeye crew has the experience to tailor the information specifically desired by various levels of the chain of command, thereby limiting the total amount of information being transmitted. In an environment where uncontested usage of the electromagnetic spectrum is not guaranteed, knowing exactly what information to send and only sending that information becomes paramount in reducing our own electromagnetic footprint. One of the biggest challenges facing friendly forces in an “over-the-horizon” war is positive identification of a contact at range. With inherent line of sight limitations there is currently very little organic capability in a Carrier Strike Group to determine what exactly a particular OTH contact is. In an area of high surface and/or air traffic, the ability to identify a contact becomes a great concern for self-defense, especially in a distributed fleet. Ultimately what is needed, and can be provided by the Hawkeye, is an ability to maintain a single persistent track with consolidated ISR from multiple assets. The airborne E-2 detects and localizes a contact, and begins to evaluate the contact using available onboard sensors. Simultaneously, the Hawkeye crew begins to work with any and all available ISR assets (EP-3, EA-18G, FA-18, UAV, surface ships) to determine any additional information to help with identification. A track with consolidated ISR information is then “pushed” to the fleet via available data links and/or voice communication as required. When the on station E-2 is forced to leave station due to the end of mission time, the relieving E-2 conducts a positive turnover of all tracks of interest ensuring no change in reported data. (Currently, station time is limited by fuel capacity, however in-flight refueling capability is currently in development for the E-2D which will significantly increase on station time). The result is a persistent, constantly communicated, consolidated “picture” of the area of interest. This picture is capable of being received by interested parties with very little, if any, electromagnetic emission. A dispersed and more offensive fleet creates some advantages for carrier strike group defense. For the threat, the left side of the kill chain becomes lengthened as it will be harder to find and track their intended targets. On the other hand if the threat is able to identify the high value unit they could face less resistance as the friendly layered air and missile defense will be reduced in strength. A reduced number of assets concentrated around the high value unit will inherently result in less overall defensive missiles, however technological advances and weapon system upgrades that have already reached initial operational capability, such as the SM-6 and E-2D, can reestablish a layered defense and reduce the number of assets required to defend the carrier strike group. Furthermore, these capabilities increase the defensive effectiveness of individual units spread throughout a distributed force. NIFC-CA is a tool that can be utilized for CSG defense and potentially establish a non-permissive environment for threat aircraft, but it is not the end-all solution. Cross community tactics must be developed to optimize weapons target pairing. Training and work-up cycles need to be significantly more integrated to exercise and reinforce new air and missile defense processes. The capabilities are in place (or will be soon) to defend a high value unit in a dispersed fleet; CVW aircrew and Surface Warfare Officers must remain flexible and innovative to most effectively employ the new capabilities available to them. An E-2d from VAW-125 launches off of the aircraft carrier USS THEODORE ROOSEVELT in support of Operation Inherent Resolve. Photo taken Ben Hayashi (US Navy). The E-2D Advanced Hawkeye is uniquely equipped and positioned to facilitate the deception of dispersed forces, the targeting of the adversary and ultimately, the destruction of designated targets. This assistance and support can enable the surface force to indeed perform better with a more lethal positioning of forces distributed across the battlespace. The development of distributed lethality will include identifying current gaps in training and capability that can make our force more lethal. As we as a Naval force continue to develop innovative ways to counter adversaries, we would be wise to develop cross-domain warfighting tactics and increase the interoperability of our forces. LCDR Christopher Moran and LT Ryan Heilmann were both assigned to VAW-125, the first operational E-2D Advanced Hawkeye squadron. Their views do not necessarily represent the views of U.S. Department of Defense, the U.S. Navy, or any other agency. [i] Vice Admiral Thomas Rowden, Rear Admiral Peter Gumataotao, Rear Admiral Peter Fanta, ‘Distributed Lethality’, Proceedings Magazine – January 2015, vol. 141/1/1.343.